Taichung is located in the wst coast central part o Taiwan, to th north boarders with Miaoli and Hsinchu County, to the south with Changhua and Nantou County, to the east with Hualien County, north-east with Yilan County and west facing Taiwan Straits. Has a population of about 2.6 million people, make it the thrid largest city after New Taipei and Kaohsuung. Taichung is a modern and dynamic Asian city, marked by boulevards, high-rise buildings, and convenient transportation system. Taichung is also home to many high-tech manufacturers such as optoelectronics and precision machinery industries. Because of its geographic location easy accessible for the residents or visitors from all part of Taiwan, plus it is surrounded by famous tourist attraction and her pleasant climate, beautiful scenery, the rich history of art and culture has made Taichung a great city to visit. At the east-west cross-island highway of Taiwan, is the area of Guguan hot spring area located. 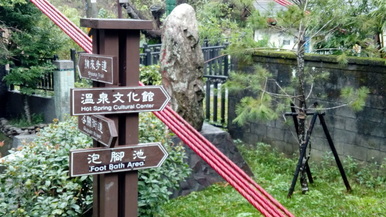 This area there is a free area for visitor to have their leg soaked and relax at the surrounding area - the hot spring park. Two suspension bridges, the Guguan Suspension Bridge and Shaolai Suspension Bridge for you to scroll through, enhoyed the scenic mountain view, aborigial shops for you to get some souvenir home, hot spring museum to learn more about hot spring, restaurants, convenience store and of course numbers of hot spring spa and hotels are around too. A Place that will give you a superb relaxing experience. A secluded area up the mountainous county of Taichung the Lavender Cottage is one of the coziest, cute and relaxing little place, a dreamy garden, completed with its own restaurants, shops, merchandises and accommodation. Not only flowers in the cottage, there are many beautiful corners for phots taking, coffee shop to sit around and bath in the lavender's aromas, feel the total relaxation and quietness of this dream land. A real hide away spot from the busy city. During the Japanese occupation this mountain is name by the Japanese as 'eight thousand mountain', because the main mountain is at about 8,000 Japanese's feet in height, 2,400 meters. The name 'eight thousand mountain' sound like 'eight immortals' in Mandarin and that is how is name 'Basianshan' now. At that time this mountain is one of the important centers of Taiwan loffing industry, together with Alishan in Chiayi and Taipingshan in Yilan, the Taiwanese government stop logging business in the 80's and convert it to a recreational area to preserve the nature of the county. Now this park is food for hiking, forest baths, appreciate the beautiful scenery, bird-watching and now you are able to stay in the villa within the park for further explore the beauty and enjoyed the real hide away in this wonderful recreation forest. Ranked number-one night market in Taiwan in year 2015, has become a must see tourism spot in Taichung, some say if you have never visit Feng Chia Night Market, then you have not been to Taichung, that shows how famous it is, and it really comes alive after sunset. this cover area of Wenhua Road, Feng Chia Road, Xitun Road, Fuxing Road and all of the lanes and alleys in between, is big enough for you to spend two nights to go around. The night market was full of quality clothes, bags, shoes, souvenirs, mobile phone accessories and of course foods and snacks! You can find all these at reasonable price, bargain is allowed at certain stores.